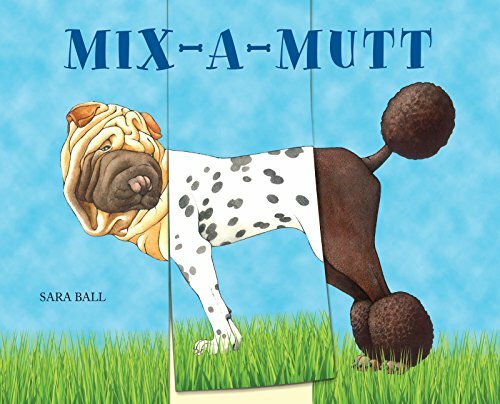 Here comes a board book for young children with the interactive appeal they love, not to mention the fun to be had in mixing and matching dog breeds to create unique—if improbable—new breeds. Sara Bell is the illustrator of Flip-o-Saurus and Flip-o-Storic, which invited little ones to imagine their very own dinosaurs. Now Bell’s brought this playful approach to the world of canines. The die cut pages allow readers to discover wacky combinations of 1,000 possibilities from three sections: the head, the middle, and the rear end of the animal. Plus the weights are included. A Yorkshire is about seven pounds and a Great Dane can weigh 175. Aimed at children from two to eight, Mix-a-Mutt’s biographical notes will intrigue them after the early impulse to mix and match the panels has waned. Kids love learning things because it empowers them. It’s smart to engage them both visually and in upping their understanding of some of the varieties of man’s best friend. This book might succeed in rivaling iPads and other smart devices and provoke both creativity and sharing with siblings and friends and parents. Who doesn’t want to invent a unique dog with a Komondor head, a Dachshund middle, finished off with a Great Dane rear end?